AFSCME Local 207 members, supporters from Occupy Detroit protest U.S. District Court Judge Sean Cox’s imposed cuts at federal courthouse Oct. 25, 2012. By the way, Sherry, just WHERE did you get the idea that the UNION refused to disclose the make-up of its membership, and why are you and Dave both insisting that 81 percent of the DWSD workforce should be laid off before Local 207 takes any action? 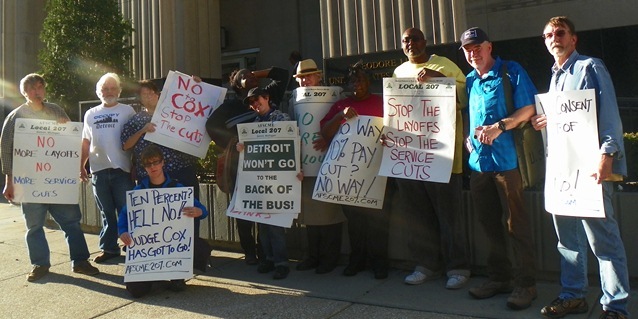 As far as federal courts are concerned, it is the FEDERAL SIXTH CIRCUIT COURT where AFSCME Local 207, Council 25, and SAAA filed appeals of Judge Cox’s orders. Their appeals were heard Oct. 9 and we are still waiting for their ruling. If it is against them, they can take it to the U.S. Supreme Court, which they will do. You both fail to understand the increasingly anti-worker, racist and sexist climate in which we are dealing, which permeates the banks and corporations that really rule our system, as well as the government and courts. There must be a mass movement like those of the 30’s and 60’s to overcome this. Not folks sitting back comfortably in their armchairs and making comments which serve no purpose to further that movement. The article about federal law and protected classes is very interesting. It’s probably correct that 70% of the employees of the DWTP are female and persons of color. The consultant report states that any layoff that is proposed will be by worker classification. If the layoff is for 10 people in a given classification, the union rules require layoff by seniority of the workers in that classification. If you make the layoff by any other metric , it would require a change in the union rules, and an exception to the existing federal discrimination laws. It would be extremely doubtful that any union would agree to modify their seniority rule, that’s why they are not responding to your request. My thought is that you can ask the leaders of the ASFCME union to specify in writing just what basis they would utilize to determine which workers in that class get released when a layoff for that particular class of workers is ordered. that conflicts with the Constitution is Void! The Civil Rights Act-Title 7 (Disparate Impact) forces an employer to select an alternative (to mass lay-offs of Protected Classes in this case the 70%+) policy that has a lesser impact on the protected classes. I do understand that the U.S. Department of Justice Eric Holder did not respond to Conyer’s request. But, we pay our unions to enforce federal law as it pertains to our protected employment terms and conditions. Is there anyway, Diane that you could an article about the Civil Rights Act Title 7-Disparate Impact. I have research that I could share with you. The point which both Dave and Sherry miss is that the power of the unions ultimately lies in their members’ power to withhold their labor. The sitdown strikes of the 1930’s established union recognition and collective bargaining. The unions have no magic wand to MAKE the employers, courts, and federal government comply with their demands, other than calling strikes, which Local 207 members did. Dave, when you say the union needs to agree to alter its seniority rules, you completely miss the point that virtually all of the workers in DWSD are Black and women, and have been for MANY years. 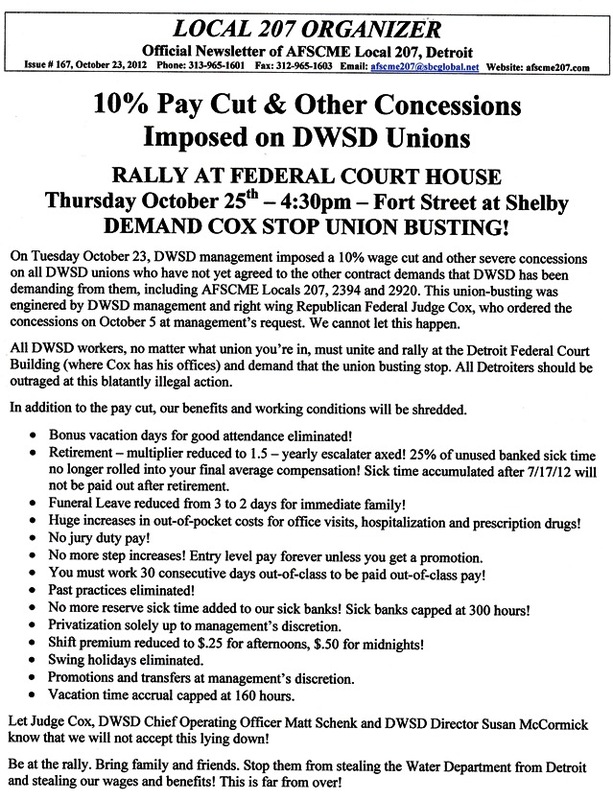 Local 207 has been fighting to overturn Judge Sean Cox’s orders mandating the dismantling of DWSD in the courts, and to stop the City Council from approving the EMA contract which would eliminate 81 percent of jobs at DWSD. You appear to think those at the top of the seniority lists are white and male. That is by no means true. I worked for the city from 1974 through 1999, when I retired early. The vast majority of city employees, when I entered the workforce in 1974, were BLACK due to residency rules. Many whites fled the city after the 1967 rebellion. You seem determined to put all the blame on Local 207’s members and its leadership, instead of stepping forward yourself to participate WITH them in collective direct action, such as the strike they conducted. to stop the RACIST and SEXIST takeover of the DWSD. Dave, you appear to want the union to accept the EMA contract and Judge Cox’s orders and then deal with seniority. That is absurd. Local 207 wants to defend ALL the rights of its majority Black and women workers, as well as the rights of Detroiters, who are at least 82 percent Black, to continue OWNERSHIP of the DWSD. No matter how you twist your arguments, you come across as anti-union, not pro-worker, pro-Black or pro-women. You are absolutely right that women and Blacks (particularly Black women) make up most of the city’s workforce. Those who work at the WWTP, members of AFSCME Local 207, struck Sept. 30 to protest the conditions to which they were and are subjected, and the proposed elimination of 81 percent of the DWSD workforce. (Put DWSD or WWTP in VOD search engine to bring up stories on strike and numerous prior stories, which show numerous Black and women workers on the picket line.) Hopefully you were among those who supported them on the picket line. They were BETRAYED by the top leadership of AFSCME Council 25. You are correct that the City of Detroit, the State of Michigan, AND the federal government (including Judge Cox) are violating federal law which protects people of color and women. The blame, however, rests on the employers, on Michigan’s virtually fascist government, and the U.S. Department of Justice as well as the federal government. U.S. Rep. John Conyers wrote to U.S. Attorney Eric Holder on Dec. 2, 2011 asking him to launch an investigation of Public Act 4 because it disproportionately affects the voting rights of most of Michigan’s African-Americans. HE HAS RECEIVED NO RESPONSE TO DATE. Public Act 4 is enabling the dismantling of the largest majority-Black city outside of Africa, Detroit. The blame does NOT rest on the shoulders of the members and leadership of Local 207, who have repeatedly raised the racist nature of the assault on their membership, and fought against all odds while on strike. As a result, they are now subject, involuntarily, to a “last-chance” agreement to retain their jobs, which means they can be fired for ANY offense in the future. Council 25 negotiated this agreement in the wake of its SHAMEFUL failure to support the workers’ strike. Put the blame where it belongs. 1. Is the City of Detroit following the Department of Labor’s Federal Employment Laws as it pertains to Protected Classes? This means any changes to employment terms and conditions must factor in the Protected Status of its employees. I have asked some union elected officials and they cannot give me an honest and straight answer as to if “They made sure that their employees’ federally protected rights were not being violated by the City of Detroit. There is some negative entity in this City and State that is surpressing the overall Demographics of public workers (both City, DPS, County and State) which Women and Blacks make up approximately 70% of the workforce. By suppressing the Demographics, the unions have enabled the State of MI. and the City of Detroit to bypass the Civil Rights Act, Federal Employment Laws, and all other Constitutional Laws that pertains to people of color and women. Somebody is getting paid a lot of money to “Not Rock the Civil Rights – Disparate Impact Boat! Take the Devil’s money and he will Reward you too! They will eventually have to atone for this.